Covertrim (UK) Ltd is a family run business that has been providing a service to aviation and marine customers for many years. Restoration of the interior means not only the seating for passengers and crew, but head-linings, bulkheads, carpeting, and re-laminating of galley units and tables. As a supplier of upholstery, combining traditional skills with the most up-to-date materials, they are the preferred supplier to the National Grid, The Metropolitan Air Support Unit and the Essex and Cambridge Police Forces. Plus, many well-known celebrities, and corporate organisations. Also, approved supplier to Marshall Aerospace, Cambridge, the UK’s leading independent aerospace contractor with a worldwide reputation for engineering excellence. In designing the upholstery, whether for fixed-wing aircraft or helicopters, the utmost consideration is given to the type of fabric, practicality, style and the customer’s individual requirements. All the materials used are purchased from suppliers with an in-depth knowledge and experience of the aviation and marine worlds, conforming to the latest EASA.CS25.853 flammability regulations. The company is highly skilled in manufacturing any piece of upholstery from a single seat to the most complex unit, measuring, producing, re-foaming and fitting the upholstery to ensure a quality product on every occasion. 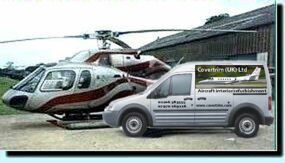 Covertrim (UK) Ltd should be your choice for your next aircraft interior refurbishment. Covertrim (UK) Ltd is located in the picturesque village of West Mersea some 10 miles along the B1025 south-east of Colchester in the County of Essex. Mersea Island is deservedly regarded as a place to be visited. It is the most easterly inhabited island in Britain, and at its highest point is 75 feet above sea level. The Blackwater Estuary is an appointed site of special scientific interest with breeding and feeding grounds for oysters and wading birds.